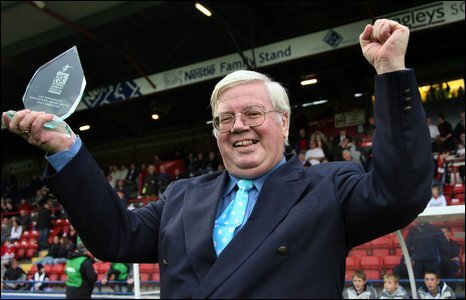 I noticed that today is the fourth anniversary of Tonys final whistle. I don't have anything poignant to say, just that he still remembered by his family, by his friends, by the non league football world, and by this website. Also the fact that life goes on - debates - 1-2-4-8 etc - but reassuringly stays the same. Can't believe it's been 4 years, just where has the time gone? Echo what Steve has already said. When I meet people at matches I sometimes ask if they're Kempsterites. And if they ask about the forum I tell them to search for the Non League Matters website or just type in Tony Kempster. When Tony started the oroiginal site I don't think he could possibly have imagined the influence it would have on so many people's lives. I've still got "Tony's Non- League Forum" in my "Favourites" and use it to log in. I never met Tony, but I'm proud to be a Kempsterite. I've met people from this forum down the years, got invaluable advice from many more, and have even helped out one or two people myself. To me, that is his legacy, long may it continue. I also ask people if there 'on kempster' when i first meet them. This website and the forum is a fitting legacy and ongoing tribute. I, also, bookmark this site as Tony still and class meeting any Kempsterites at a match as a 'Tony Tick'. A fitting tribute indeed that his vision did - and continues to influence people young and old and his legacy will probably outlive us all!!!! A bump for another year played. Where does the time go??? Yes, I thought a few days ago that the anniversary was nearing. Read the "Final Whistle Has Been Blown" thread again the other day. I never know Tony. But its to him I owe thanks to for falling in love with the non league game when I stumbled upon his website. It was a sad loss when he passed. Many thanks goes to the people that has kept Tony's memory alive with this site. Was lucky enough to know him, work on the same floor as him and also with his son Ian. As a young non league footballer at the time, I was only starting to understand his influence on this crazy group of non league followers when I knew him, and only understood his legacy after he was gone. I enjoyed talking with him, he was well liked and respected in the workplace, and was quite simply a lovely guy who loved non league football. Another year on. I'm sure I'm not the only one in remembering today. I hope Tony's family are all healthy and happy, if a little sad today. seconded... I was about to post something similar. It's still called Tony's forum and many of the older members still call themselves 'Kempsterites'. Tony started something and I'm very glad that between us we've been able to keep it going after he was gone... not just a very active forum that is probably THE place on the internet for intelligent non league discussion but also for the main site which pulls the world of non league football results, fixtures and tables into one single online place thanks to all the people who give up their time to contribute to it. I think he would be okay with that. RIP Tony. Your passion and commitment fueled so many. We carry on in your honour and tread the trail you left us behind. You sir are a legend and we continue in your name. You're legacy is our bible and your commitment is now ours too. You will always be remembered. Could anyone post a picture of Tony, never met him but as many have said he really started something with his website.